Or, "Is it worth my time to sue this guy?" Six months after starting Vennum PLLC, and just in time to host an epic summer law clerk program, I set out to find the Firm an office. With the help of our rock star real estate agent, it took less than a week to find our new home. Everything was perfect. Near downtown Matthews, quiet but not isolated, the Office Space shared a building with two other companies. One of the other companies owns the building, and the company president acts as Landlord. I liked the idea of sharing a building with another company and I loved the space. I’d already decorated it in my mind, and couldn’t wait to make it ours. Even though I am a die-hard realist who never believes a deal is done until the check clears the bank, this new phase in the Firm’s life made me so happy, I went ahead and changed my google maps setting so the address showed up as “Work.” A lawyer buddy of mine, a fellow solo practitioner who focuses on trademark law, agreed to rent one of the offices, and we already divided up the coffee and printer paper responsibilities. We couldn’t wait! Almost immediately after my agent told the Landlord’s agent we were interested, we received an initial Lease Proposal. After negotiating and agreeing on a few adjustments, we revised the Lease Proposal so it reflected the terms we wanted for the lease. 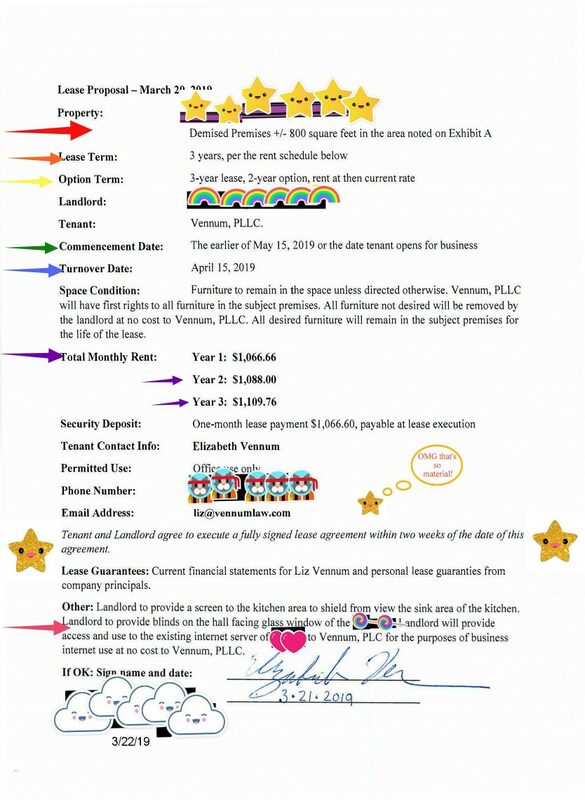 Near the end, the Lease Proposal noted in italics that Tenant and Landlord agree to execute a fully signed lease agreement within two weeks of the date of this agreement. I signed on behalf of the Firm on March 21, and on March 22, the president of the Landlord company (let’s call him “Landlord”) countersigned on its behalf. The Landlord’s agent sent over a full lease agreement reflecting the same terms, and I began initialing and signing as I reviewed it. By the end, however, being a lawyer and being risk-averse, I wasn’t comfortable signing until I got clarification on a few side issues.1 My agent agreed it was worth getting clarification, so he reached out to the landlord’s agent with my questions. Then… crickets. Nothing happened for several days. Our rock star agent followed up with the Landlord’s agent, but didn’t hear anything back for more than a week. Then, yesterday, I missed a call from my agent. When I replayed the voicemail, my heart sank. He said he heard back from the landlord’s agent and asked me to call him back. Reassuring myself this was just some minor technicality, maybe we’d have to pay for our own internet after all, I texted my agent and, half-joking, said that his message sounded serious and I wanted to make sure everything was okay. Unfortunately, it wasn’t. He called back right and apologized for bringing bad news. The Landlord’s agent had emailed and told him the existing tenant was going to expand into the space I wanted to lease. Apparently, the Landlord used my interest in leasing the space as a negotiating tactic to get his existing tenant to agree to expand. He never intended to lease the space to me in the first place. First of all, lawyer jokes and stereotypes notwithstanding, I don’t lie. Because I want other people to be honest with me and trust me, I take pains to be good at my word. If I don’t intend to follow through with a deal, I don’t waste time negotiating. My default mode when meeting new people is to assume they’re honest as well, until proven otherwise. The few times someone has legitimately screwed me over have taken me completely me by surprise. Not only did the Landlord’s little charade waste my time and crush my special snowflake dreams, but it wasted the time of my real estate agent, who dedicated quite a bit of work to setting up and negotiating the deal. And don’t get me started on my trademark attorney friend, she had her hopes and plans pinned on this new space as well. You can mess with me, but don’t you dare mess with my people. Okay, but… What can I do about it? Being a lawyer, I sat down to consider my legal options. Contrary to popular belief, lawyers don’t just sue anybody for anything and recover buckets of money.2 If the facts of your situation don’t satisfy the requirements for a legal claim, you’re out of luck. When considering any possible lawsuit, an attorney reviews her client’s facts through the framework of the relevant legal standards. So, just like I would do if a client came to me with a case, I got to work overthinking the situation. The other party’s breach caused damage to you. Failure to meet any one of those three elements defeats your case. For my own internal review I include a fourth and unwritten but crucial requirement: 4. Does this sh*t make sense? Does it make sense for my firm to represent this client in bringing this legal action? Did the landlord and I have a valid contract for Vennum PLLC to lease the office space? Did his breach cause damage? And, my favorite element, number 4. Does it make sense for me to sue the landlord for my hurt feelings breached contract? Well, the answer is… it depends. Did We Have a Valid Contract? The landlord and I didn’t sign a formal Lease Agreement, but that doesn’t necessarily mean no contract existed. 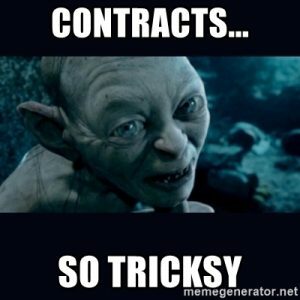 Without subjecting you to the full force of contract law nerdiness, let’s just say that the nuanced and multi-faceted complexity of contract law provides endless opportunities for lawyers to disagree. At the most basic level, a contract requires an offer and acceptance. When you make an offer and I accept it, provided we have the same understanding of what’s going on, we’ve just created a contract. Mutual understanding is key.3 If you offer me $5.00 assuming I know you’re trying to buy my bike and I accept your $5.00 but think you’re paying me back for lunch yesterday, then we don’t have a contract for the sale of my bike. But I’m still keeping the $5.00. When Does an Agreement Become a Contract? If you offer to buy my bike and I accept your offer but say we’ll need to negotiate the price, then we don’t have a contract.4 We don’t have a mutual understanding about price. Even after we emerge from fierce negotiations with a signed agreement that the price is $5.00 and the sale will be final upon execution of a formal purchase agreement next Saturday, we still don’t have a contract we could enforce in court.5 We both agreed that something else had to happen before the bike sale was finalized. On the other hand, if we write down the basic terms of our bike sale on the back of a napkin to seal the deal until your lawyer can type them up real fancy, then maybe we do have an enforceable contract and maybe your fancy lawyer charges you too much. The difference between our cocktail napkin and the “signed agreement” in the previous paragraph is that we both agreed the cocktail napkin sealed the deal, while we both understood something else had to happen before the terms of the signed agreement went into effect. What are the Essential Terms of a Commercial Lease? 4. Rent set not only for this year, but for the next two years. Assuming we’ve avoided issues with another legal rule,“the statute of frauds,” I’d say we’ve got a solid argument in favor of the Lease Proposal’s being an enforceable contract. Did the Landlord Breach the Contract? Yes. See: my salty tears of disappointment. Can I Recover Damages from the Landlord’s Breach? What Damages are Available for the breach of my Lease Agreement? Emotional Distress – Sorry, guys, there’s no crying in contracts. We’re not going to recover money damages for emotional harm or mental distress. That’s not because big girls don’t cry or any stupid sh*t like that. Crying is perfectly acceptable and emotional damages have their place, just not in contract law. Lawsuits aren’t about getting what you want. Lawsuits aren’t about justice. Lawsuits are about getting money damages.8 Every now and then, however, the court will give you exactly what you want by granting the remedy of specific performance. You don’t hear much about specific performance because it only makes sense in certain cases. Consider this example: You hire Bob’s Renovations, a local contractor, to renovate your bathroom and pay him in advance. Halfway through the job, however, you and Bob have a disagreement and he quits. If you sue Bob, you may be able to recover some of the money you paid him, but no judge is going to force Bob to come back and finish your bathroom. First of all, any capable contractor can step in and finish the job. No offense to Bob, but his skill set is not unique. Second, forcing someone to work against his will violates the Constitution and basic common sense. You’re mad at Bob, he’s mad at you, you don’t want him in your house anymore and he doesn’t want to be there. If you forced him to finish, he’d do a crappy job and you’d both be miserable. The logical remedy in this case is that you take any money damages you recover and use them to hire someone else to finish the job. But what if Bob were special? What if Bob isn’t just a contractor, but an artist, whose custom tile installations grace only the most exclusive residences? What if only Bob can finish your bathroom mosaic tribute to the Grateful Dead? Your circumstance might fall within the narrow exception for specific performance. The remedy of specific performance is an equitable remedy of ancient origin. Does a Lawsuit Make Sense? So, even if I’ve got a halfway decent case against the Landlord for breach of contract, and even if a judge might give me my office space, does it make sense for me to sue the Landlord? Do I really want to share a building for three years with someone who doesn’t want me there and only suffers my presence because of a court order? Also worth considering is the opportunity cost of taking on another lawsuit. Vennum PLLC has a lot of cases in active litigation right now. Our docket is hopping, and I can’t really afford to spend time on a spite lawsuit. Even if we settled for money damages, the sum of money I could recover from suing the Landlord would be less than I could have earned if I spent that time doing actual work for my actual clients. Nothing about that lawsuit sounds appealing. It’s the Landlord’s loss, though. We would have been awesome tenants. In particular, the office space was on the second floor of a building that did not have an elevator. My concerns about accessibility were addressed by the landlord’s agent, who assured me we would have access and the ability to use the first-floor conference room. The lease agreement did not mention use of the conference room, and also contained a clause making me, the tenant, responsible for the cost of ADA compliance up to the price of one year’s rent. Our company did not build the building, nor did we choose the renovations that made the second floor accessible only by stairs, therefore I did not feel like we should be responsible for the cost should the space be deemed noncompliant. Other than the question about ADA compliance, the only other questions I had were several places where it appeared the landlord’s agent forgot to check boxes about whether a certain responsibility fell to landlord or tenant. The allocation of responsibility was spelled out in the text of the lease, but I wanted the boxes checked, because lawyers are annoying like that. In Boyce v. McMahan, the court refused to enforce a contract because it contained the following language: “[the Parties] desire to enter into a preliminary agreement setting out the main features…and to execute a more detailed agreement … at some specific and subsequent date to be agreed to by the parties hereto.” The court reasoned that the contract itself stated it wasn’t final, and therefore the court would not enforce it as such. Boyce v. McMahan, 285 NC 730 (1974). Northington v. Michelotti, 121 N.C. App. 180, 184 (1995) (citation omitted).